Backdropped by Earth's horizon and the blackness of space, the Cupola of the International Space Station and a docked Russian Progress spacecraft are featured in this image photographed by an Expedition 26 crew member while space shuttle Discovery (STS-133) remains docked with the station on March 2, 2011. HOUSTON – NASA's space shuttle Discovery is poised to cast off from the International Space Station for the last time today (March 7), nearly 12 years after the prolific spacecraft's first visit to the orbiting lab. 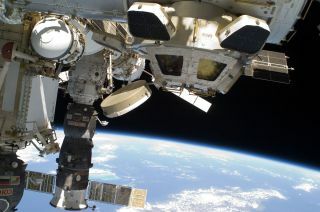 Discovery and its six astronauts will undock from the space station at 7 a.m. EST (1200 GMT), to end an 8-day visit that delivered a new storage module, extra supplies, and a humanoid robot assistant to the orbiting laboratory. Discovery will then spend two days in orbit before landing at NASA's Kennedy Space Center in Florida on Wednesday, March 9. Discovery Discovery launched on its final flight on Feb. 24, and arrived at the space station two days later. NASA decided to extend the original mission by two days, giving the shuttle a total of 13 days on orbit. The flight's primary goal is to help outfit the station for the years ahead, when NASA will no longer have the enormous cargo-carrying capability of the space shuttles.